The traditional concept of Russula virescens calls for a beautiful green russula with a quilted pattern on its cap surface, found under chestnuts and other hardwoods in Europe (the species was originally named in Germany) and North America. However, if you have paid much attention to what's going on in the world of mushroom taxonomy these days, you will probably not be surprised to hear that the traditional concept turns out to be pretty inaccurate. 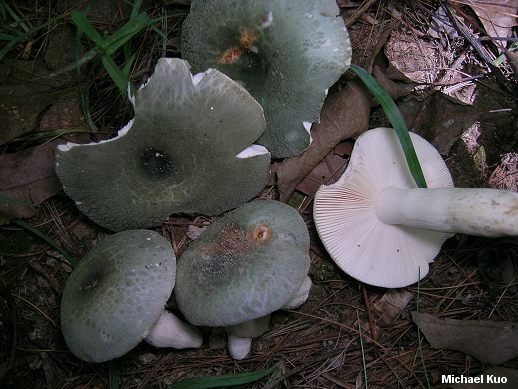 Russula virescens, it turns out, is strictly a European species; in North America "the virescens-crustosa group is much more complex than suspected and embraces at least a dozen taxa in the eastern US" (Buyck & collaborators, 2006). 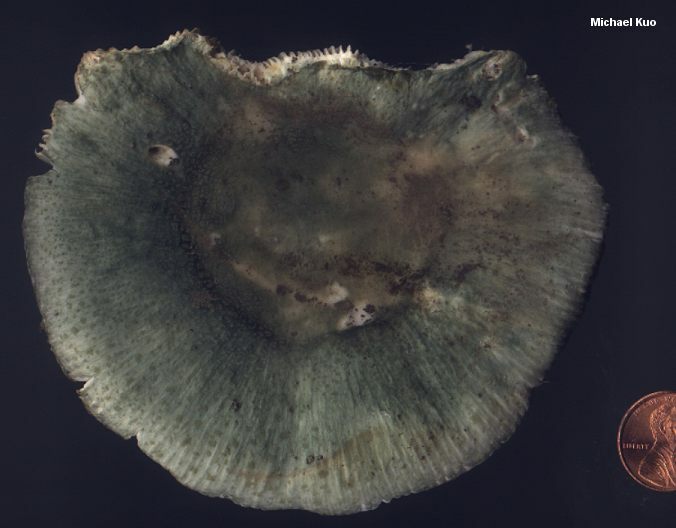 Most of these DNA-defined species have yet to be published, but Russula parvovirescens, with its blue-green colors and very large patches, is one that can be fairly easily recognized without a sequencing laboratory. As for the rest, we have no choice but to call them "Russula virescens" and "Russula crustosa" for now, while we await further publications. Ecology: Mycorrhizal with hardwoods (but I have collected it under conifers with no hardwoods nearby); growing alone or gregariously; summer and fall; widely distributed east of the Rocky Mountains, and occasionally reported in western North America. 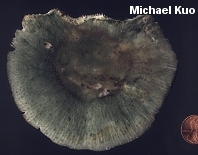 Cap: 5-15 cm; round to convex when young, becoming broadly convex to flat to uplifted with a shallow depression; dry; velvety; the surface soon cracking up into small patches; green to yellowish green; the margin not lined to very slightly lined; the skin peeling about halfway to the center. Gills: Attached to the stem or nearly free from it at maturity; close or crowded; white to cream. Stem: 3-9 cm long; 2-4 cm thick; brittle; dry; smooth; white; discoloring brownish with age. Flesh: White; brittle; thick; not changing when sliced. 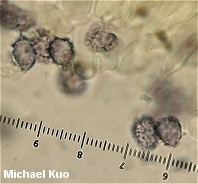 Microscopic Features: Spores 6-9 x 5.5-7 µ; elliptical to subglobose; warts extending to 0.5 µ high; connectors variable (nearly absent, scattered, or creating partially reticulated areas). Pleurocystidia scarce. 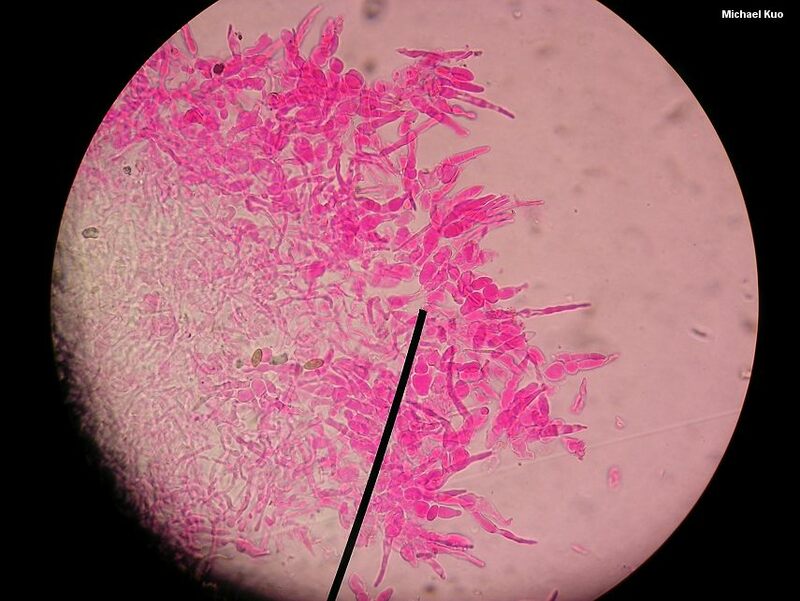 Pileipellis a cutis overlaid with epithelium-like areas (the crustose patches) composed of elements of chained cells diminishing in width from base to tip, with the terminal cell projecting an extension that is frequently elongated and tapered; pileocystidia cylindric with capitate apices, positive in sulphovanillin. REFERENCES: (Schaeffer, 1774) Fries, 1836. (Saccardo, 1887; Burlingham, 1915; Beardslee, 1918; Kauffman, 1918; Smith, Smith & Weber, 1979; Arora, 1986; Kibby & Fatto, 1990; Phillips, 1991/2005; Metzler & Metzler, 1992; Horn, Kay & Abel, 1993; Roody, 2003; Miller & Miller, 2006; Kuo, 2007.) Herb. Kuo 06279502, 08300203, 07090702, 07120701.